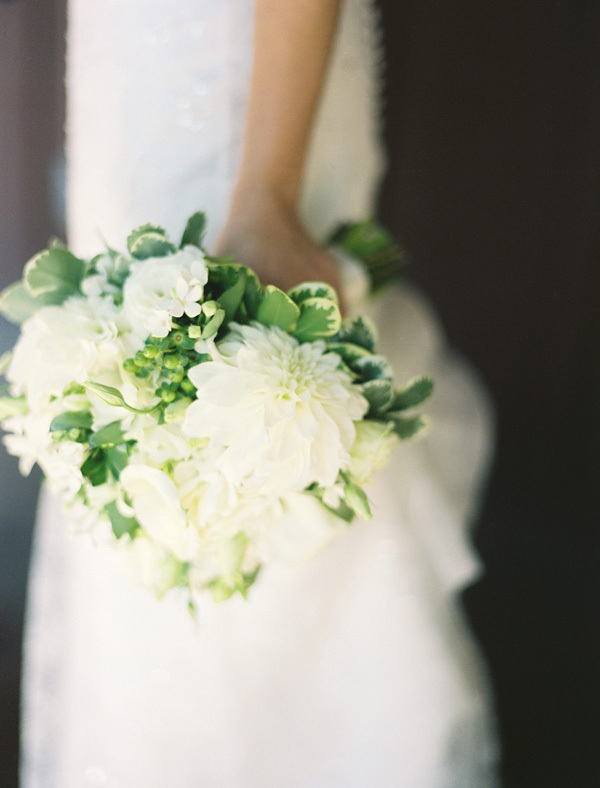 This lush bouquet, full of white dahlias and peppered with vibrant greens, was too stunning to ignore. The white flowers keep it classic and elegant, but the rich greens let everyone know this bride is as warm as she is sophisticated. Photo by Melanie Jade, Bouquet by Lucy's Informal Flowers. I love dahlias! So pretty. love the dahlias! i had never considered them for a bridal bouquet until my friend got married last fall. beautiful and unique choice. GORGEOUS, I love how fresh the color choice is. i'm with everyone else... those simple dahlias just make it! ..Lush bouquet..oh,I adore how it sounds and how it looks like! Thank you,Lena,for the sweetest comment about my picnic and pictures! You're so cute! So pretty - I want these on my kitchen table. Beautiful! I didn't love my wedding bouquet and now when I see gorgeous photos like this I just wish I could go back and redo my flowers! Jillian, I absolutely LOVE where you're going with your color palette-swoon! Dahlias aren't one of those flowers you see or hear a lot about when you're growing up, but they're just so stunning! I adore green and cream. Such a wonderful and fresh combination. White dahlias make my heart pit-er-pat-er! Love a simple, sophisticated bouquet! i'm loving dahlias more and more! I'm such a fan of Dahlias. They are one of my favorite flowers. Love how the green pops against the white. I love the green and white look, I think it looks so clean and classic! sophisticated is the word, my dear. so beautiful. love the idea of white flowers in a wedding bouquet! love colors - but more than anything always love a classic white bouquet. sophisticated + warm sounds like a perfect combination to me. :) just lovely. Lovely. Green is so awesome.